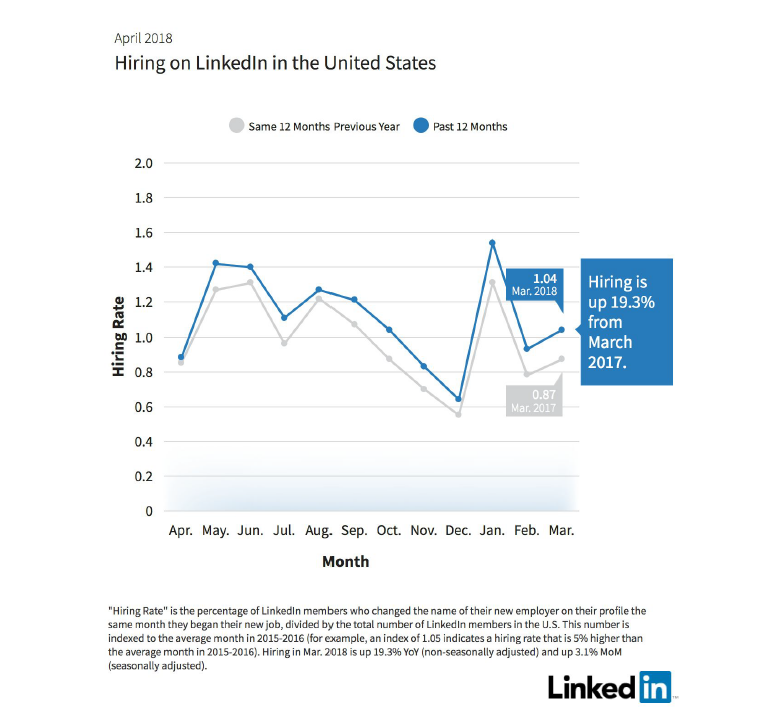 U.S. employers hired significantly more people in March than last year, according to the LinkedIn Workforce Report, a monthly analysis of employment trends. Hiring across the U.S. was 19.3 percent higher last month than a year earlier, the LinkedIn data showed. Compared with February, the seasonally adjusted hiring figure was 3.1 percent higher than. “Hiring has been slightly better through the start of 2018 than it was in the second half of 2017, but year-over-year comparisons will become more challenging as we move into spring when hiring skyrocketed last year,” LinkedIn said. Last year, the LinkedIn report showed that hiring cooled in March. In May, however, the report showed the strongest for hiring since June 2015. The sectors with the biggest year-over-year increases were financial services and insurance, 20.9 percent higher, aerospace, automotive and transportation, up 19 percent, and manufacturing and industrial, 18.8 percent higher. LinkedIn noted that hiring appears to be slowing in the professional services, which was up 9.9 percent in March. LinkedIn’s report is compiled from its 146 million user profiles in the U.S and 20,000 company profiles. LinkedIn has more than 11 million active job listings globally and has more than 3 million new job listings added in the U.S. every month. The Labor Department will release its closely watched monthly employment data on Friday. On Wednesday, ADP and Moody’s Analytics said private companies added 241,000 positions in March, higher than the 205,000 economists surveyed by Reuters expected.